During the Fort William World Cup over the weekend, Shimano invited a select bunch of journos to come check out some of the new pedals and shoes the Japanese brand has been working on lately. 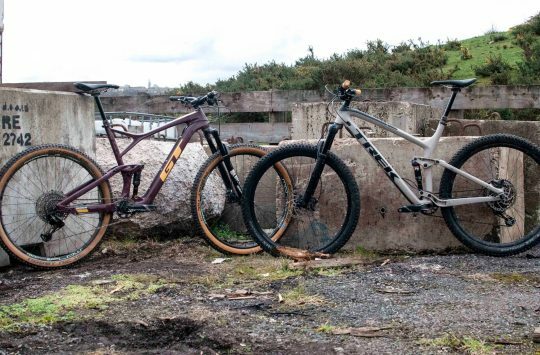 Fitting for the weekend’s events, the shoes and pedals in question are designed for gravity-type riding, and were launched in conjunction with the Athertons who came along to the presentation to chat about their experiences with the new gear. 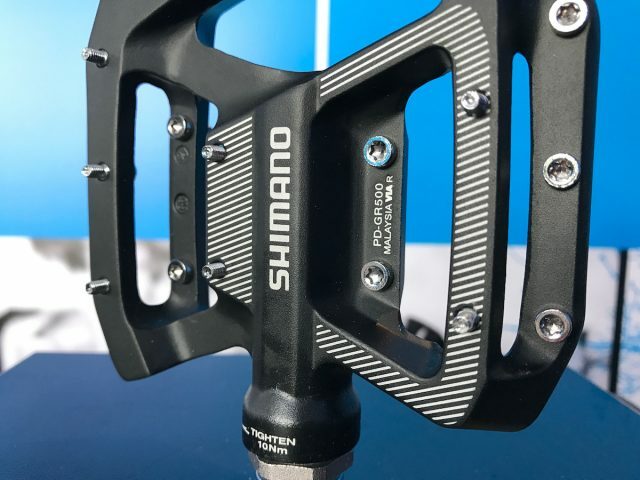 Despite the new pedals being equipped to handle the rigours of World Cup level downhill racing, they’ll likely be just as popular with trail riders and enduro racers, and Shimano even pointed towards the exploding e-MTB market as being an ideal candidate for the new pedals and footwear. 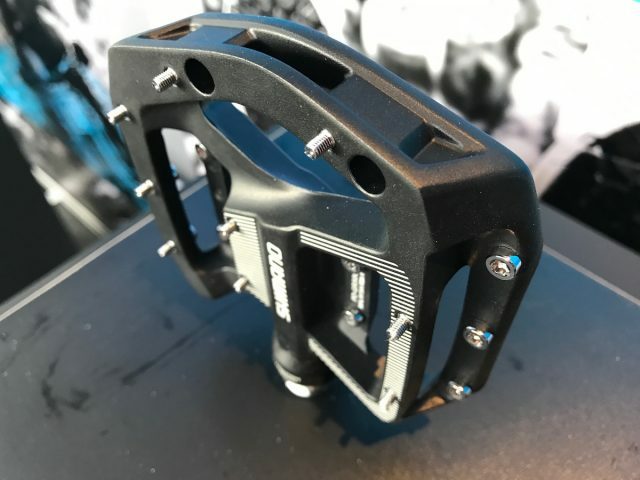 Here we’ll have a look at the new pedals specifically, though keep your eyes peeled on the website for a separate article on the new shoes too. The Shimano Saint M820 pedal is the first of its kind. At the launch, Shimano had one SPD pedal it was showing off; the brand new Saint M820. Although Shimano already has platform-style SPD pedals in its range, such as the longstanding DX pedal and the Deore XT Trail pedals, the Saint is a completely new design that is the first to feature adjustable pins and a broad alloy platform suited to flat-out downhill bombing. Designed for aggressive trail riding and downhill racing. The alloy body provides a large platform between shoe and pedal, with machined grooves and traction pins delivering less twist and more shout. Compared to the existing DX pedal it’s essentially replacing, the new Saint M820 is completely different. For a start, it features an alloy pedal body rather than the nylon body used on the DX. The broad alloy platform features machined grooves on either side of the SPD mechanism to help increase traction and stability, while four adjustable pins per side allow for more bite into the sole of the shoe when conditions get slippery. The addition of pins came about during the Saint M820’s development when Shimano clocked that some of its athletes were screwing pins into the plastic body of the DX pedals. Shimano is the only brand to make both pedals and shoes. The Saint M820 is perfectly paired to the new AM9 shoes. The SPD mechanism itself is shared with Shimano’s current line of XC and trail pedals, and it has adjustable spring tension front and back. 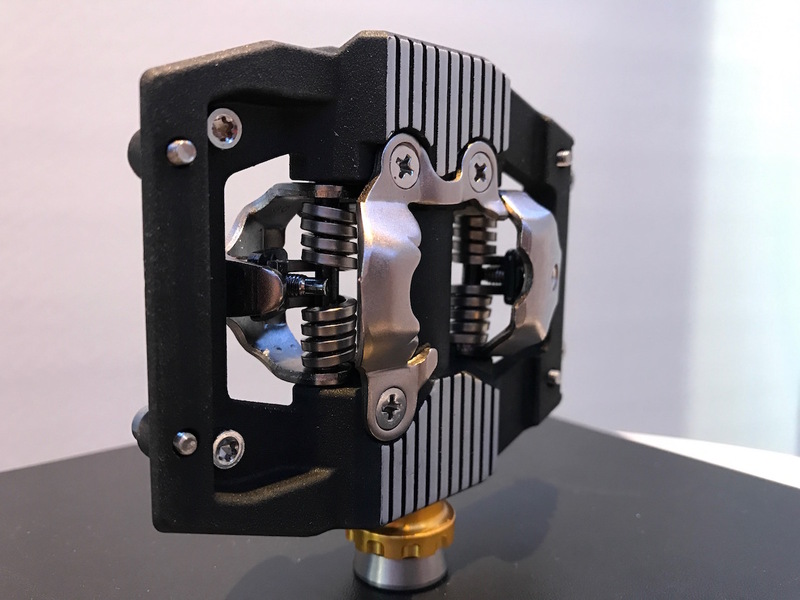 Unlike the DX pedal, the SPD mechanism doesn’t use the spring-loaded pop-up design, which offers a lower stack height, less moving parts, and increased durability. 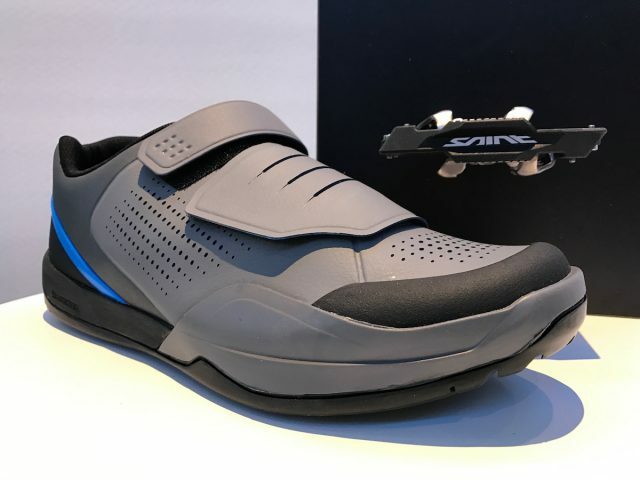 Shimano was keen to make a point about it’s ‘Power to the pedal’ philosophy with the new pedal and shoe range, which basically refers to the fact that it has designed its shoes and pedals to work together as a system. 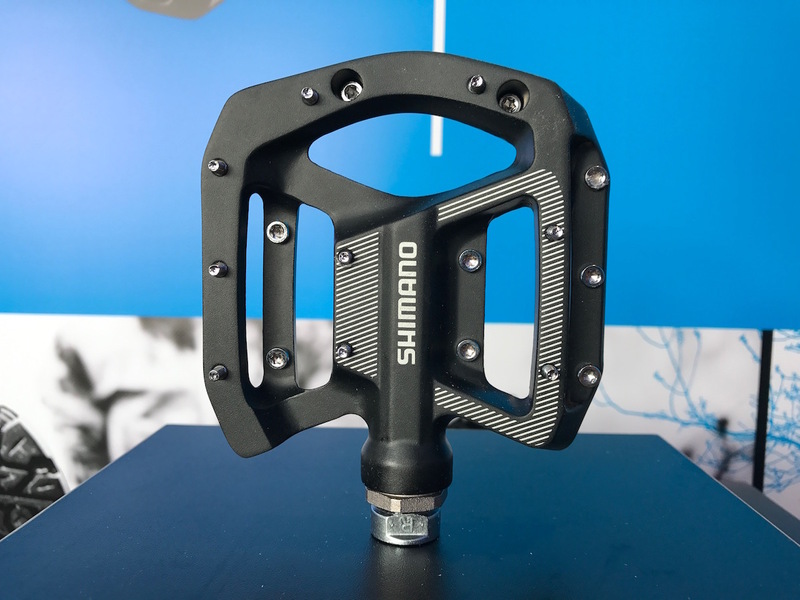 Of course the pedals are compatible with other shoe brands, but there has been considerable engineering and test time dedicated to mating Shimano’s own shoes with its own pedals – an advantage that Shimano has over every other brand out there. 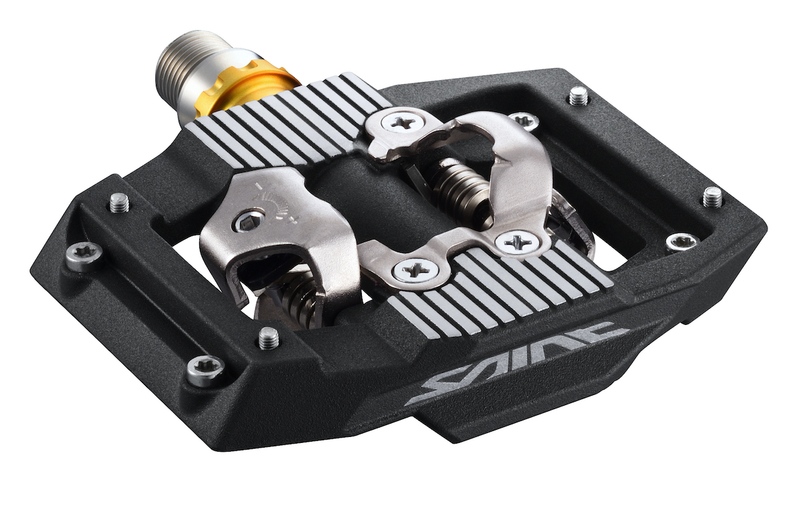 In the case of the new Saint M820 pedals, they’re made to integrate seamlessly with Shimano’s latest AM9 and AM7 SPD shoes. 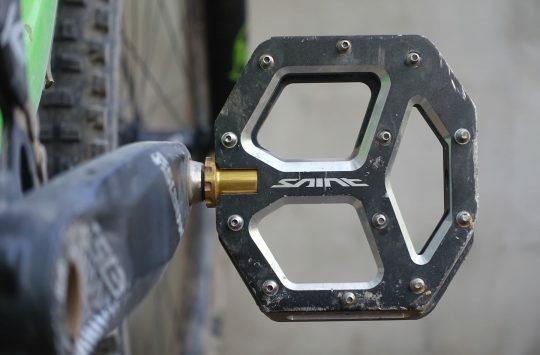 New uber-tough Saint flat pedals too. For non-SPD riders, Shimano also had a new flat Saint pedal, called the M828. 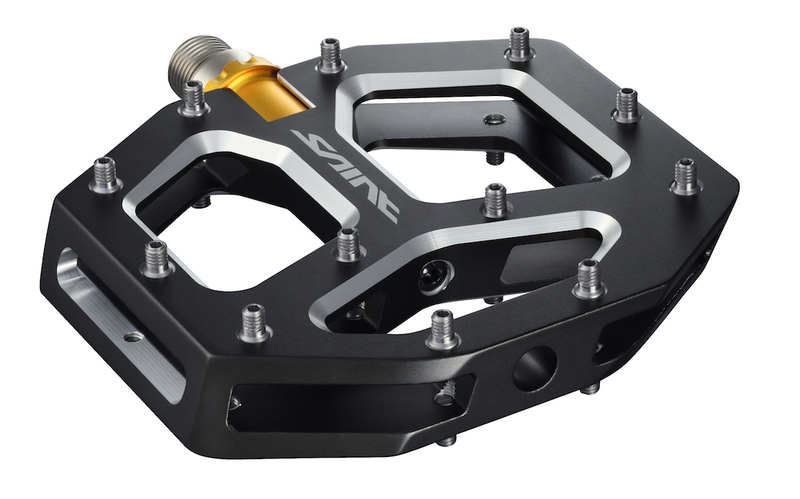 Replacing the current Saint pedals, the new version offers up a slightly broader but thinner platform. The platform is also more concave, and it features the option of 3mm or 5mm pins. The internals have also been updated, with Shimano wanting to develop the strongest flat pedal it possibly could. The new cromoly axle is stiffer and stronger than before, reducing the chance of bending or breaking the spindle on a really hard impact. 12 pins per side, and the option of 3mm pins or 5mm shin-eaters. Compared to the previous Saint pedals, the new version gets an extra few pins, making it 10 per side. The steel pins are threaded, and use a small hex key to loosen or tighten them. Included in the box with the new pedals are two sets of pedals; one set of 3mm pins, and another set of 5mm pins. In addition to the concavity that’s already machined into the alloy pedal body, you can also increase the overall concavity by running the shorter 3mm pins in the centre of the pedal body, and 5mm pins at the fore and aft of the pedal body. The new cromoly axle is stronger, and the sealing design has been borrowed from Shimano’s XTR hubs. Keeping the pedals rolling is a series of adjustable bearings that use a cup ‘n’ cone design. Rather than the sealed cartridge bearing style found in other brands pedals, the cup ‘n’ cone design offers up easier serviceability, with a small plastic tool unlocking the gold alloy sleeve that threads into the pedal body. Once undone, you can access the steel ball bearings inside to clean and re-grease as necessary. 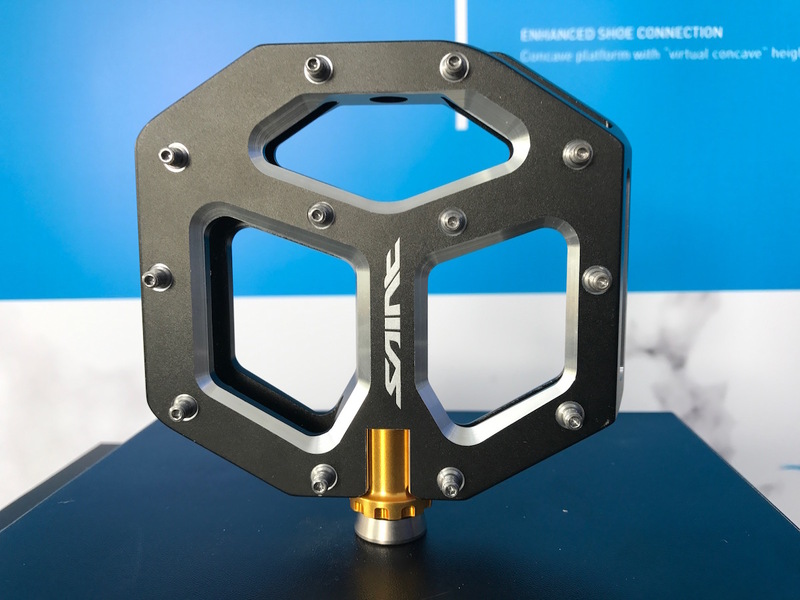 For those adverse to servicing, Shimano has equipped the Saint M828 pedal with the same Labyrinth seal design used in the XTR hubs, so there’s less chance of crud and water making its way inside the pedals in the first place. The new Shimano Deore XT flat pedals are pitched to trail riders and enduro racers. Alongside the new Saint SPD pedals, Shimano are also introducing a brand new Deore XT flat pedal – the first of its kind. Designed for XC, trail and enduro, the new XT flat pedal is available in two different platform sizes and features a hollowed-out alloy body. A cromoly spindle and cup ‘n’ cone bearings keep everything spinning, while adjustable pins maximise shoe-to-pedal gripiness. The XT’s are available in two different sizes, with the large sizing up at a generous 110x115mm. Slightly concave body shape, with the option of 3mm or 5mm pins. 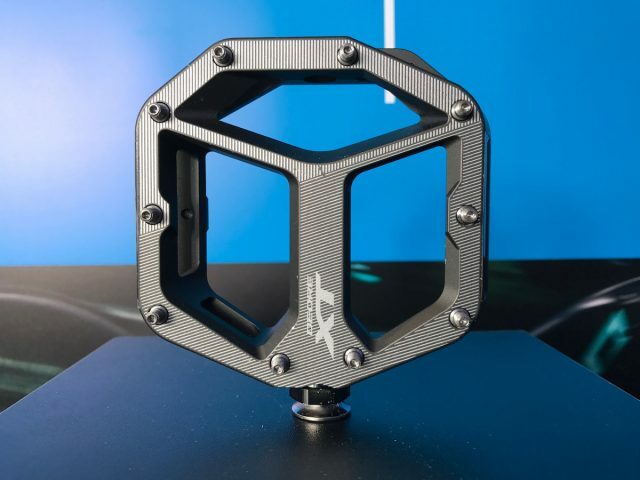 Although it might not look like it, the XT flat pedals have a slightly concave design to the alloy body along with 10 removable pins per side. 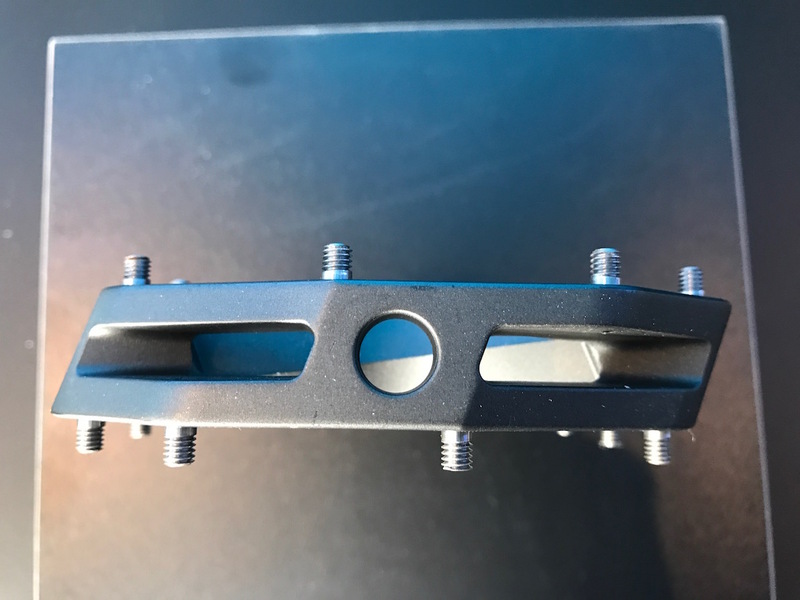 Like the Saint pedals, the XT’s can be equipped with your choice of 3mm or 5mm pins, and for those who want to increase concavity for more traction and shoe support, you could always run the shorter pins in the middle, with the longer pins at the front and rear. 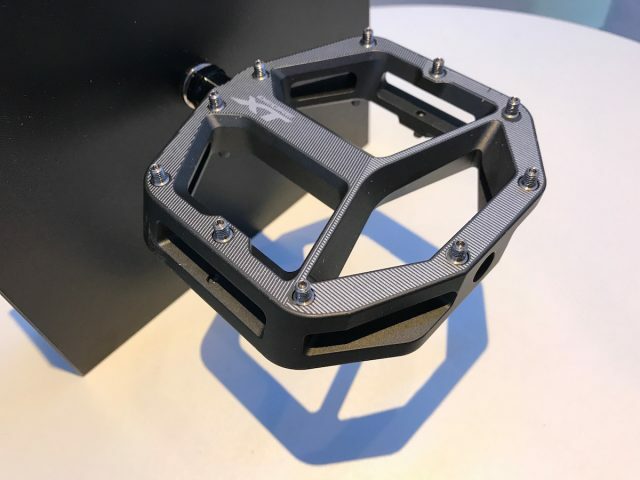 The GR500 pedals are the same design as the existing Saint MX80 pedals. 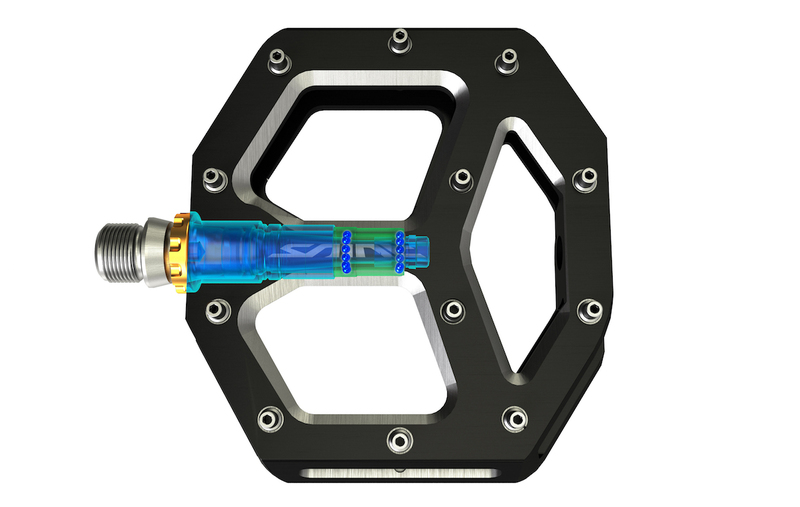 Last but not least is the new GR500 pedal. Except it’s not really new. 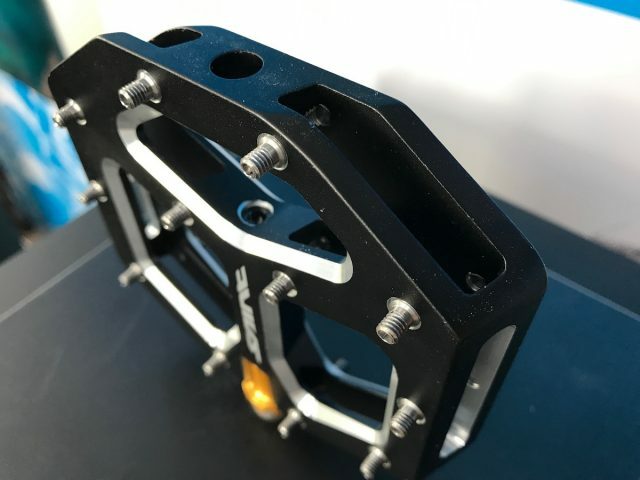 Those familiar with the current Saint MX80 pedals will recognise the pedal body on the GR500s, as it is exactly the same, with the same bottom-mounting adjustable steel pins. Internally the GR500 pedal is the same as the Saint MX80s, with only the gold alloy bearing nut having been traded for a slightly heavier and cheaper steel nut instead. 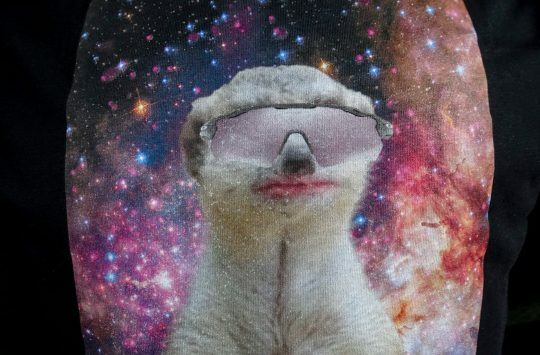 As a result, the new pedals come in at a lick under 60 quid. A change to a steel bearing nut has helped drop the price. 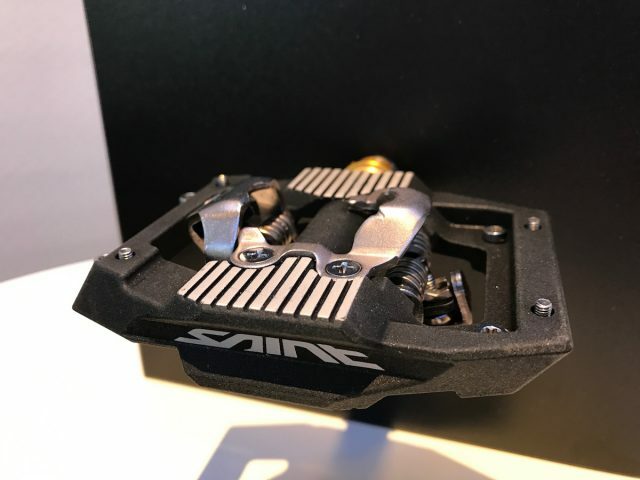 Same alloy body as the existing Saint MX80 pedals, and same adjustable pin design. About time they caught up with others using their SPD tech and a wide pedal. Hope the axles are long enough for big footers like me. Great news on the smaller size option but 16.4 mm really isn’t thin enough. Really? Vaults are listed as being 17mm. Seem popular enough.